March 27, 2019 – (Wilmington, Ohio) Business before the Clinton County Port Authority (CCPA) Board of Directors last week focused on infrastructure projects at the Wilmington Air Park. Action on five projects was authorized by the Board of Directors. Combined, these projects will result in an investment of approximately $3 million in aviation-related infrastructure improvements. Sealed bids will be received by the Clinton County Port Authority at the Wilmington Air Park, 1113 Airport Rd, Wilmington, OH 45177 until 12:00 P.M. EST, on the 11th day of March, 2019 at which time said bids will be opened and publicly read for the #2019‐1 ‐ Runway 22R Pavement Repairs project for the Clinton County Port Authority, in accordance with the specifications on file in bid #2019‐1 ‐ Runway 22R Pavement Repairs. Sealed bids will be received by the Clinton County Port Authority at the Wilmington Air Park, 1113 Airport Rd, Wilmington, OH 45177 until 12:00 P.M. EST, on the 18th day of March, 2019 at which time said bids will be opened and publicly read for the #2019‐2 ‐ Wind Cone Replacement project for the Clinton County Port Authority, in accordance with the specifications on file in bid #2019‐2 ‐ Wind Cone Replacement. The Clinton County Port Authority (Port Authority) Board of Directors recently approved three facility leases representing nearly 140,700 square feet of space in three buildings at the Wilmington Air Park. The Clinton County Port Authority (Port Authority) received a Notice of Project Approval (NPA) indicating that it has successfully secured grant funds from the Ohio Department of Transportation (ODOT) FY2019 Ohio Airport Grant Program. These funds will be leveraged with Port funds to complete repairs of concrete on the north east end of the runway, and to replace and relocate wind cones at each end of the runway. 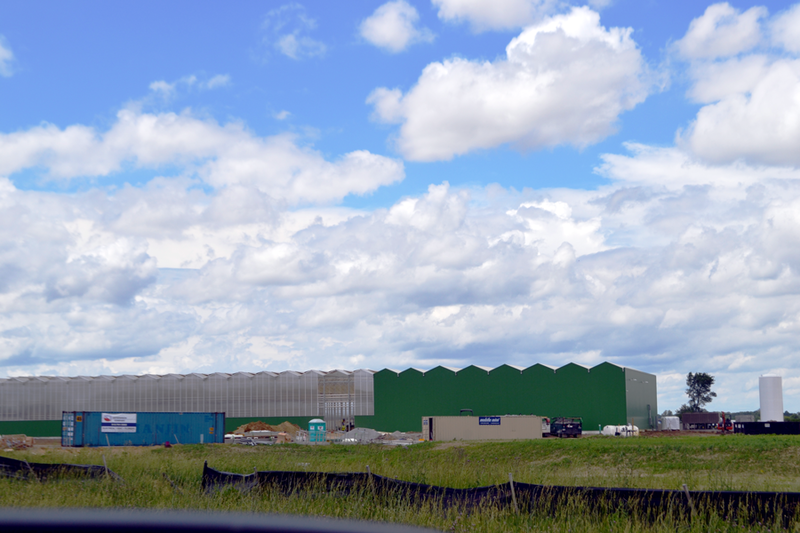 The Bright Farms facility is under construction on David’s Drive. Its announcement to locate in Wilmington, Ohio, bringing capital investment and jobs to the area, was one of the projects included in the submission for the Governor’s Cup Award. - Funds Still Available for Assessments, Cleanup Planning - The Clinton County Port Authority (CCPA) and the Clinton County Regional Planning Commission (CCRPC) applied for, and received, a $200,000 Brownfields Assessment Grant from the US Environmental Protection Agency. Partnering with SME, a consulting-engineering firm with experience in Brownfields Assessments, five properties throughout the county have been assessed. MAIN STREET, PORT AUTHORITY PARTNER TO SUPPORT FESTIVAL - Main Street Wilmington recently partnered with the Clinton County Port Authority to secure a $5,000 sponsorship investment, designed to benefit the ongoing work and mission of the Main Street Wilmington organization. The University of Akron and Airborne Project on Pathway to FAA Certification - Wilmington, Ohio -- March 27, 2017 -The Wilmington Air Park is proud to be the home of a partnership to add value and safety to the aviation industry through applied technology. Air Park tenant Airborne Maintenance and Engineering Services, along with the University of Akron, welcomed several guests for the ribbon cutting on its new Supersonic Particle Deposition Booth. The process employs a supersonic jet of an expanded gas containing metal particles to bond with a solid surface on impact. It is part of a pilot program funded by the State of Ohio and including partners NCERCAMP (University of Akron), SAFE Engineering, US Technology Corporation and Airborne Maintenance and Engineering Services. Wilmington Air Park Welcomes New Tenant Wilmington, Ohio – May 20, 2016 – The Clinton County Port Authority and the Clinton County Regional Planning Commission received word this week that the Port Authority has received a $200,000 Brownfields Assessment Grant from the US Environmental Protection Agency (US EPA). Clinton County Receives Brownfields Grant Wilmington, Ohio – May 20, 2016 – The Clinton County Port Authority and the Clinton County Regional Planning Commission received word this week that the Port Authority has received a $200,000 Brownfields Assessment Grant from the US Environmental Protection Agency (US EPA). FAA Authorizes Flight Test Research for Workhorse Group HorseFly(TM) UAS CINCINNATI, Oct. 14, 2015 (GLOBE NEWSWIRE) -- The Federal Aviation Administration (FAA) granted a Certificate of Authorization (COA) to the Ohio/Indiana UAS Center and Test Complex, allowing Workhorse Group Inc. (OTCQB:WKHS) and the University of Cincinnati (UC) to continue their joint development of Workhorse Group's HorseFly™ UAS, which is designed to fly to and from a standard delivery vehicle. Testing of HorseFly will take place at the Wilmington Air Park in Wilmington, OH. FAA Authorization Propels UC's UAV Work Skyward The high-flying endeavors in unmanned aerial vehicle testing and research at the University of Cincinnati just got a new lift from the Federal Aviation Administration. This week the FAA granted UC's Department of Aerospace Engineering and Engineering Mechanics and Department of Mechanical and Materials Engineering certificates of authorization (COA) to test five types of UAVs, or drones, in Wilmington Air Park, less than an hour's drive from campus. Permission to also fly with the West Virginia Division of Forestry is still pending. DAN EVERS SELECTED BY CLINTON COUNTY PORT AUTHORITY The Board of Directors of the Clinton County Port Authority recently announced that Dan Evers has been selected to be the new Executive Director. A seasoned public official with significant economic development background, Evers brings a wealth of experience to the Port Authority to continue its work in Clinton County. CLINTON COUNTY PORT AUTHORITY EXTENDS DEADLINE FOR PURCHASING COORDINATOR APPLICANTS - The Clinton County Port Authority has been seeking applicants for a Purchasing Coordinator position. Originally, the advertisement that ran in the Wilmington New Journal on July 24 and July 30 noted an August 7 deadline for resumes. The deadline has been extended to August 14, 2015. 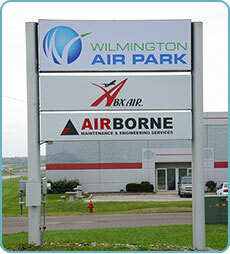 Wilmington Air Park Receives Excellence in Economic Development Award - The Wilmington Air Park received a Gold Excellence Award in Economic Development for News from the Runway. Carbon Nano-Firm Locates at Air Park - A small firm in the unmanned aerial systems (UAS) industry has moved its operations from Wright-Patterson Air Force Base to the Wilmington Air Park. Manufacturer Moves Into Wilmington Air Pak - An advanced materials manufacturer has moved into Wilmington Air Park as it moves into the unmanned aerial systems industry. The Wilmington Air Park - Hub for Foreign Trade - A trio of Clinton County's leaders recently embarked on a 10-day trip into Turkey, tasked with finding solutions to some of the area's major economic development questions, including those that may unlock the key to trading soybeans and livestock for the entire country. Sinclair College Receives Authorization to Fly UAV's at Wilmington Air Park - College to partner with community and industry. Ohio City That Became Recession Focus Rebounds - Yahoo News - Ohio city that became recession focus reboundin slowly. Wilmington keeps public job tally. Air Transport Services Group Expand Wilmington Operation - Aviation Maintenance - Wilmington Air Park officials have confirmed that (ATI), a subsidiary of Air Transport Services Group, expects to move as many as 80 airline and flight operations positions from other states to the Wilmington Air Park.